We get our fair share of jaw-dropping weather in Minnesota, but flash floods, blizzards & even tornadoes pale in comparison with the most fearsome storms on Earth, hurricanes. The word "hurricane" derives from the Mayan god "Hurakan", who 'blew his breath across the chaotic water and brought forth dry land and later destroyed the men of wood with a great storm and floods', according to NOAA. Hurricane Lane is steaming toward the Hawaiian Islands. It was an extreme Category 5 storm with 160 mph sustained winds, but some weakening is likely today. 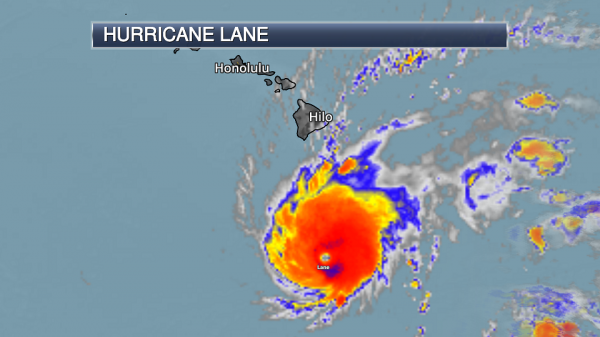 Even so, Lane may buffet Maui and Oahu with 100 mph wind gusts and a storm surge of 3-6 feet by Friday. Sneak out to the State Fair today (if you won't get caught) because heavy showers and T-storms may dump nearly 1 inch of rain late tonight into Friday; probably the wettest day in sight. Saturday looks drier, sunnier and warmer, but a stalled front sets of multiple rounds of T-storms next week. It may look and feel more like late June than late August, but we need the rain. The timing is unfortunate but let's roll with the punches. It can always be worse. Photo credit of Hurricane Lane: NASA International Space Station. 84-Hour Rainfall Prediction. NOAA's 12km NAM model prints out some half inch amounts for much of the state (much of that coming Friday). Some 1"+ amounts can't be ruled out as bands of showers and T-storms ripple across the Upper Midwest. Some drying is likely over the weekend as storms become much more widely scattered. Map: pivotalweather.com. Fall in No Particular Hurry. September is one of my favorite months - still plenty of warmth, but lower humidity levels and far fewer nasty thunderstorms to track on Doppler. GFS guidance hints at temperatures running well above average through the second week of September for most of the USA. September Outlook. NOAA NCEP's CFSv2 climate model shows a mild bias for much of the nation next month, with the possible exception of the East Coast. Sigh of Relief? Old Farmer's Almanac Predicts Milder Winter for Minnesota. Here's an excerpt from Star Tribune: "...The almanac says the coldest periods will be in much of December and from late January into February. The snowiest periods will be from mid-November until mid-December, and early and late March. “If this is a typical El Niño winter, odds are most towns will see less snow,” Douglas said. “I love snow, and a lot of people do, so my advice is when it does snow this winter, take advantage and don’t assume it will stick around indefinitely.” Last year, Old Farmer’s Almanac said most of the state would be mild and dry, with the southern part being mild and snowy. “It got some parts right and some parts wrong … but even a milder winter can be character building,” Douglas said." Stop the Presses - New Winter Outlook from Old Farmer's Almanac Is Out. Bring Me The News has a few highlights: "...According to the Old Farmer's Almanac, most of Minnesota is in for a warm and dry winter, although a sliver of southern Minnesota and all of Iowa are looking at a warm and wet winter pattern. "Our milder-than-normal forecast is due to a decrease in solar activity and the expected arrival of a weak El Niño, which will prevent cold air masses from lingering in the North," the Almanac says. Other climate experts agree. 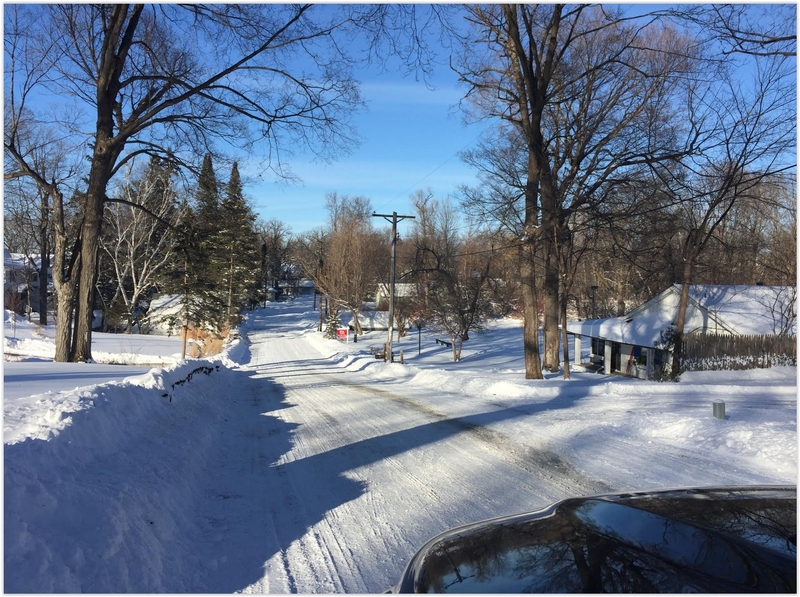 In July, climatatologists from NOAA released data suggesting that there is at least a 50 percent chance Minnesota experiences a warmer-than-normal start to winter in December, January and February..."
IRI Enso Forecast. The prediction of a milder-than-average winter is consistent with a brewing El Nino warm phase in the Pacific Ocean in the coming months with water temperatures a few degrees (F) warmer than average into the winter months. El Nino correlates with milder winters for most of the USA, although it's worth noting that every El Nino is different. Details via IRI, The International Research Institute for Climate and Society: "The following graph and table show forecasts made by dynamical and statistical models for SST in the Nino 3.4 region for nine overlapping 3-month periods. Note that the expected skills of the models, based on historical performance, are not equal to one another. The skills also generally decrease as the lead time increases. Thirdly, forecasts made at some times of the year generally have higher skill than forecasts made at other times of the year--namely, they are better when made between June and December than when they are made between February and May. Differences among the forecasts of the models reflect both differences in model design, and actual uncertainty in the forecast of the possible future SST scenario." Overnight (mainland U.S. time) Lane strengthened into a Category 5 Hurricane with sustained winds of 160 mph. Lane is moving to the west-northwest, which will bring the system dangerously close to the Hawaii Islands later this week and into the weekend. While some weakening is expected, it is likely to remain a hurricane through at least the end of the week. Lane will bring a multitude of threats to Hawaii, including dangerous winds that could top hurricane force, excessive rain that could lead to flash flooding, and large surf along the coast. Hurricane Warnings are now in effect for Hawaii County and Hurricane Watches are in effect for Maui County and Oahu. 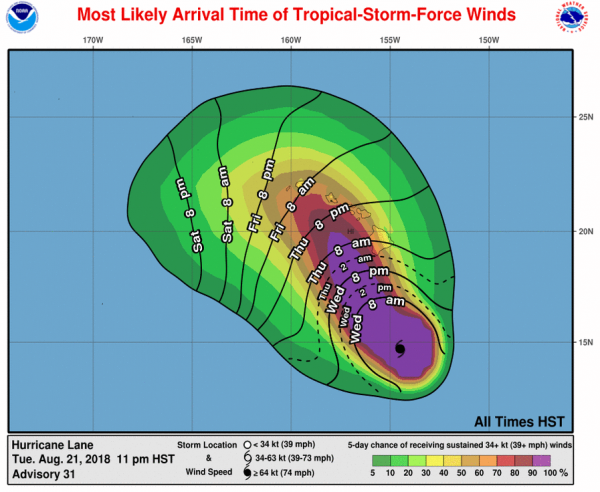 Preparations ahead of Lane should be rushed to completion over the next several days, especially across the Big Island where tropical storm force winds that could hamper preparations will be possible by late Wednesday or early Thursday. The Governor of Hawaii issued an emergency proclamation ahead of Hurricane Lane on Tuesday. 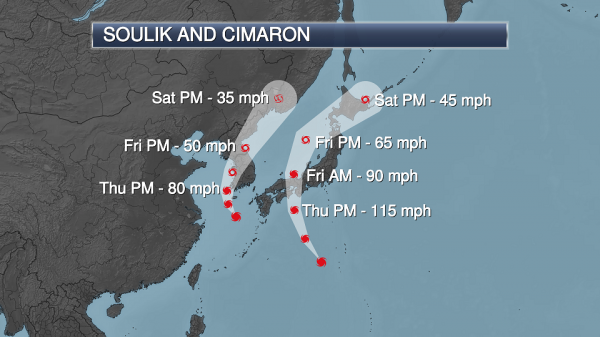 We are also tracking two typhoons in the western Pacific - Soulik and Cimaron. Soulik will impact the Korean Peninsula over the next couple days, and Cimaron will impact the southern Japan mainland (mainly west of Tokyo). Lane On Satellite. 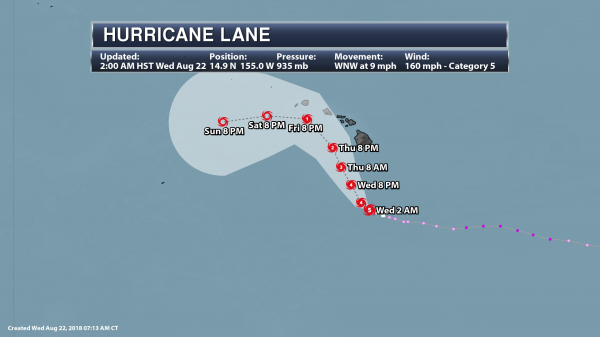 In a special statement at around 6:30 PM HST Tuesday Night, the Central Pacific Hurricane Center said that Lane had strengthened into a Category 5 Hurricane with winds of 160 mph. As of the 2 AM HST update, sustained winds were still at 160 mph as Lane was moving to the west-northwest at 9 mph. According to NWS Honolulu, this is only the second Category 5 storm to pass within 350 miles of the state within the record books. Forecast Track. Lane will start to move more toward the northwest as we head into Wednesday, with a slight turn to the north-northwest by Thursday. This motion will bring Lane very close to the Hawaiian Islands from Thursday into the first half of the weekend, and there is still the potential that Lane could move over the islands as well. It is important to not directly focus on the exact path of the system, as dangerous weather conditions from Lane will extend further out from the center of the storm. Impacts of some sort will likely be felt on all of the main Hawaiian Islands. While we do expect to see some slow weakening of Lane over the next five days, Lane will continue to be a dangerous hurricane as it moves near Hawaii. Hurricane Watches and Warnings. Due to the threat of hurricane force winds from Lane, Hurricane Warnings are now in effect for Hawaii County (the Big Island), and Hurricane Watches are in effect for Maui County and Oahu. Hurricane Warnings (meaning hurricane conditions are expected somewhere within the alerted area) are typically issued 36 hours before the expected first occurrence of tropical storm force winds. Meanwhile, Hurricane Watches (meaning hurricane conditions are possible somewhere within the alerted area) are issued 48 hours in advance. Most Likely Arrival Of Tropical Storm Force Winds. Tropical storm force winds of 39+ mph will start to reach the Big Island of Hawaii late Wednesday into early Thursday, spreading across the island throughout the morning. By Thursday evening, tropical storm force winds will be possible across most of Maui County, expanding to include Oahu Thursday night. Tropical storm force winds will reach Kauai County on Friday. Wind Threat. Right now the greatest threat of hurricane-force wind gusts will be across parts of Maui County and Oahu, starting as early as Thursday Night. 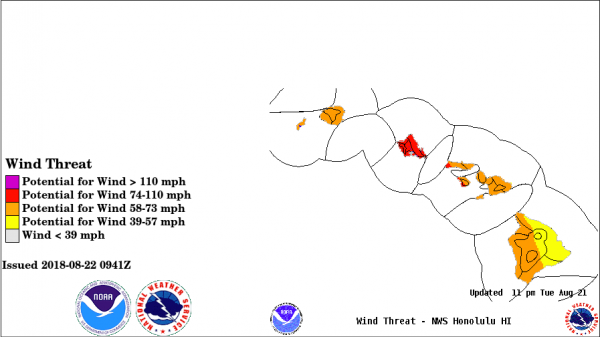 Some hurricane-force wind gusts can’t be ruled out across Hawaii County as well, especially across eastern parts of the island. You can view an interactive map of these threats by clicking here. Heavy Rain Threat. 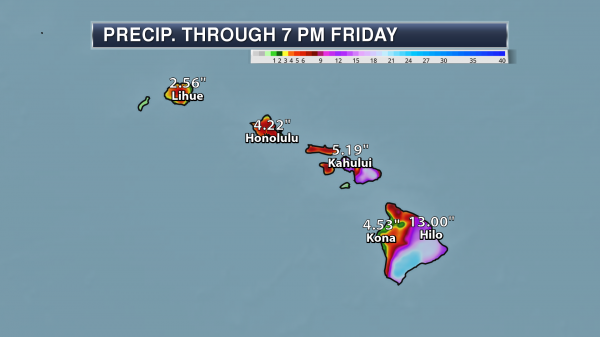 Lane will also bring the potential of very heavy rain to the Hawaiian Islands, with the heaviest through Friday evening expected across the Big Island and Maui County. Some areas, especially on the Big Island, could receive 20” or more of rain. This heavy rain could lead to flash flooding. Image credit: Praedictix and AerisWeather. Flash Flood Watches. Due to the threat of heavy rain with Lane, Flash Flood Watches have been issued for all of Hawaii from Wednesday morning through Friday afternoon. Storm Surge Threat. We will also be watching the threat of storm surge flooding, especially along the eastern coast of the Big Island and the southern/eastern coasts of Maui County and Oahu. Across these areas in Hawaii and Maui County, storm surge flooding of at least three feet above normally dry ground will be possible. In Oahu, storm surge flooding of at least a foot is possible. Two Typhoons In The West Pacific. 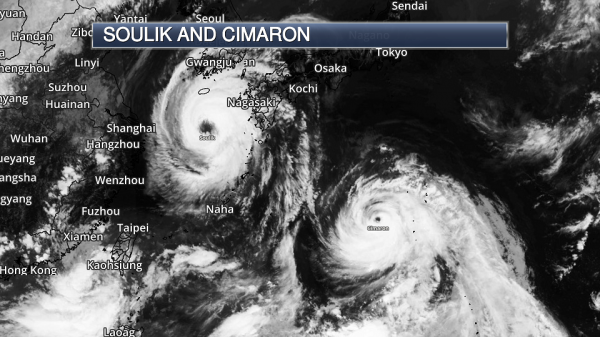 Over in the western Pacific, we are tracking two typhoons – Soulik, which has already impacted Japan, and Cimaron, which will do so in the next few days. As of Wednesday morning U.S. time, Typhoon Soulik the equivalent of a Category 2 hurricane with winds of 105 mph. Soulik was moving to the northwest at 12 mph. Typhoon Cimaron had winds of 125 mph and was moving to the northwest at 21 mph. 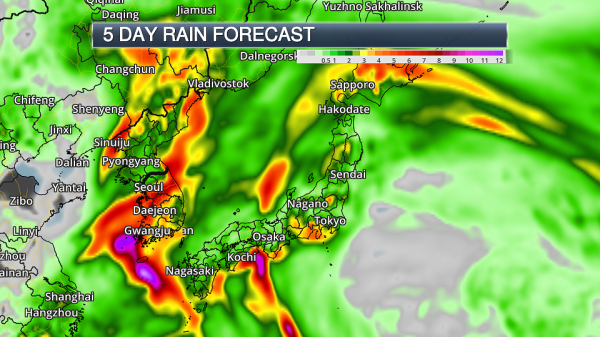 Soulik is moving away from far southern Japan and will now have the greatest impacts on Jeju Island and South Korea over the next day or two with damaging winds and heavy rain. Rapid weakening is expected as Soulik starts to interact with the mountainous terrain of the Korean Peninsula. Cimaron will continue to move toward southern mainland Japan, making landfall Thursday local time with equivalent winds of a Category 2 or 3 hurricane, though it will be weaker than the storm currently is. Cimaron will bring the potential of strong winds, heavy rain, and storm surge along with it, but the highest impacts from this system will be west of Tokyo. Forecast Rainfall. Heavy rain will be a threat with these two typhoons, with areas along the path of the systems potentially picking up 3-12"+ of rain. This could lead to flash flooding and mudslides. State of Emergency in Dane County, Wisconsin. Severe flooding is causing problems around the Madison area. Star Tribune has details. In 1968, Scientists Tried Taming Hurricanes. The experiment didn't yield any significant (positive) results, but an attempt was made to weaken the intensity of these storms, which get their energy from warm ocean water. Here's an excerpt from Science News: "...The goal of the U.S. government’s Project Stormfury, which began in the 1960s, was to knock the wind out of tropical cyclones. By injecting clouds with particles of ice-forming silver iodide, researchers hoped they could disrupt the destructive eye wall of such storms. Meteorologists tested only a few hurricanes with this cloud-seeding approach because of strict rules and fickle hurricane seasons. The project shut down in 1983. Although it failed to meet its goal, Stormfury helped scientists improve hurricane forecasting (SN Online: 9/21/17). Researchers have proposed other hurricane-busting methods, such as dispersing sulfate aerosols into the stratosphere to try to cool the planet and reduce the number of hurricanes..."
Photo credit: "Seeding Storms. 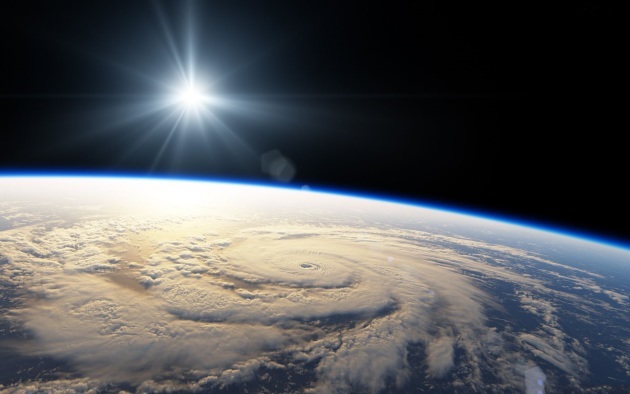 Although scientists weren’t successful in stopping hurricanes through cloud seeding, their research during Project Stormfury proved useful for future hurricane forecasting." Lt. David Cowan/NOAA. Scientists Want to Fly an Armored Warplane Into Hailstorms. Come again? Not sure I'd want to be (beta) pilot for this mission, as reported at Scientific American: "...His remarks came at the start of a three-day conference hosted by the National Center for Atmospheric Research (NCAR) to explore ways to reduce hail damage and to make better forecasts. Methods such as cloud-seeding that could prevent larger storms from forming were also discussed. Andrew Heymsfield, an NCAR senior scientist, said the lab has been in talks with the Navy to procure a surplus Navy A-10 for research missions. Known as the Warthog, the titanium-armored aircraft was used to attack tanks during the Gulf War with a nose-mounted gatling gun. The plane would be fitted with instruments and flown into large forming hailstorms to learn more about the internal workings of the most damaging storms..."
File image: Stars and Stripes. WILDFIRES: Headlines and links via Climate Nexus: "2018 Colorado wildfires part of worst year in history, five make top 20 biggest blazes (Newsweek), Colorado wildfire update: Bull Draw fire pushes above 30,000 acres (Denver Post), fireproof homes could be the answer to massive wildfires across the West." (USA Today). Wednesday visible Geo-Color image: NOAA and AerisWeather. Red Hot Planet: This Summer's Punishing and Historic Heat in 7 Maps and Charts. Capital Weather Gang has a good summary; here's a clip: "The headlines of record-crushing heat in the Northern Hemisphere began in June and haven’t stopped midway through August. Scores of locations on every continent north of the equator have witnessed their hottest weather in recorded history. The swelter has intensified raging wildfires in western North America, Scandinavia and Siberia, while leading to heat-related deaths in Japan and eastern Canada. Even with the peak of summer having passed, several locations in western North America notched their highest temperatures on record last week. They included Calgary in western Canada and Glacier National Park in Montana, where the temperature touched the century mark for the first time in 70 years of records..."
Image credit: Robert Rohde/Berkeley Earth. Hard to See, Hard to Breathe. U.S. West Struggles with Smoke. Here's a clip from Star Tribune: "Smoke from wildfires clogged the sky across the U.S. West, blotting out mountains and city skylines from Oregon to Colorado, delaying flights and forcing authorities to tell even healthy adults in the Seattle area to stay indoors. As large cities dealt with unhealthy air for a second summer in a row, experts warned that it could become more common as the American West faces larger and more destructive wildfires because of heat and drought blamed on climate change. Officials also must prioritize resources during the longer firefighting season, so some blazes may be allowed to burn in unpopulated areas. Seattle's Space Needle was swathed in haze, and it was impossible to see nearby mountains..."
F5 Tornado Hit Rochester on August 21, 1883. Wikipedia has details: "...The tornado was one in a series of tornadoes that hit Southeast Minnesota on that day, causing at least 37 deaths and over 200 injuries, The city of Rochester did not have a place to treat the injured from this tornado, as there were only 3 hospitals in the state of Minnesota outside of the Twin Cities at that time; none were near Rochester. After the tornado struck, a dance hall (Rommel Hall) was transformed into a temporary emergency room. Doctors William Mayo and his two sons, William and Charles, took charge of caring for the patients. Mother Mary Alfred Moes of the Sisters of St. Francis helped care for the patients as well. After this disaster, the Mayo family and the Sisters of St. Francis realized the need of a hospital in Rochester. They banded together to form St. Mary's Hospital, which ultimately led to the creation of the Mayo Clinic and the Tornado Guild, a group dedicated to protecting all Minnesotans from the ravages of the swirling winds..."
Beer, Drinking Water and Fish: Tiny Plastic is Everywhere. NPR explains: "Plastic trash is littering the land and fouling rivers and oceans. But what we can see is only a small fraction of what's out there. Since modern plastic was first mass-produced, 8 billion tons have been manufactured. And when it's thrown away, it doesn't just disappear. Much of it crumbles into small pieces. Scientists call the tiny pieces "microplastics" and define them as objects smaller than 5 millimeters — about the size of one of the letters on a computer keyboard. Researchers started to pay serious attention to microplastics in the environment about 15 years ago. They're in oceans, rivers and lakes. They're also in soil. 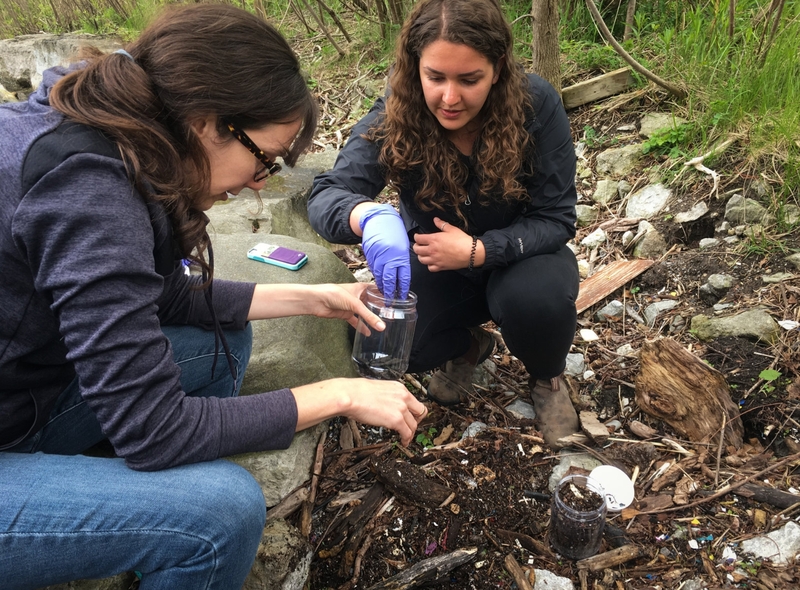 Recent research in Germany found that fertilizer made from composted household waste contains microplastics..."
Photo credit: "Ecologist Chelsea Rochman (left) and researcher Kennedy Bucci dig through washed-up debris along Lake Ontario. They're looking for small particles of plastic that make their way into oceans, rivers and lakes." Chris Joyce/NPR. U.S. Students Lag Far Behind Rest of the World in Learning a Second Language. Here's Why That Matters. Big Think offers food for thought: "...Americans spend so much time focused on bringing jobs “back,” yet we actually have no clue where they “go.” It’s impossible to compete in a global workforce if you refuse to educate yourself on anywhere beyond your neighborhood. Eight in ten Americans believe outsourcing is a serious problem and seven in ten claims that responsibility is on the individual, yet just over one-third consider that preparation should include learning another language..."
Jeff Bezos Banned PowerPoint in Meetings. His Replacement is Brilliant. Back to basics with story-telling, as reported at Inc.com: "...Anthropologists say when humans gained control of fire, it marked a major milestone in human development. Our ancestors were able to cook food, which was a big plus. But it also had a second benefit. People sat around campfires swapping stories. Stories served as instruction, warning, and inspiration. Recently, I've talked to prominent neuroscientists whose experiments confirm what we've known for centuries: The human brain is wired for story. We process our world in narrative, we talk in narrative and--most important for leadership--people recall and retain information more effectively when it's presented in the form of a story, not bullet points..."
"Humans Are a Post-Truth Species". The Guardian has a thought-provoking post; here's an excerpt: "...Whichever side you support, it seems that we are indeed living in a terrifying era of post-truth, when not just particular military incidents, but entire histories and nations might be faked. But if this is the era of post-truth, when, exactly, was the halcyon age of truth? In the 1980s? The 1950s? The 1930s? And what triggered our transition to the post-truth era – the internet? Social media? 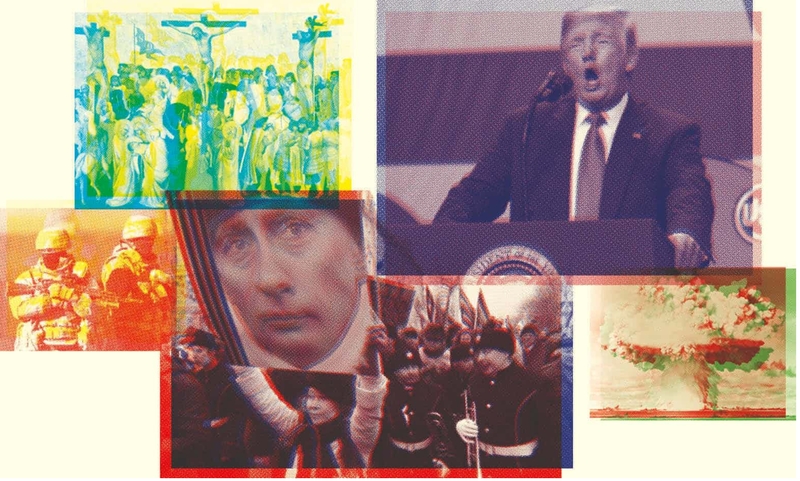 The rise of Putin and Trump? A cursory look at history reveals that propaganda and disinformation are nothing new, and even the habit of denying entire nations and creating fake countries has a long pedigree. In 1931 the Japanese army staged mock attacks on itself to justify its invasion of China, and then created the fake country of Manchukuo to legitimise its conquests. China itself has long denied that Tibet ever existed as an independent country..."
Image credit: "Power, nation and storytelling (clockwise from left)… troops in Ukraine, the story of Christianity, Donald Trump, the atomic bomb, protests against Vladimir Putin." 84 F. maximum temperature yesterday in the Twin Cities. 80 F. average high on August 22. 76 F. high on August 22, 2017. August 23, 1955: Hail in Houston County results in drifts up to a foot deep at Rushmore. Arctic's Strongest Sea Breaks Up for First Time on Record. The Guardian and MSN.com have the latest: "The oldest and thickest sea ice in the Arctic has started to break up, opening waters north of Greenland that are normally frozen, even in summer. This phenomenon – which has never been recorded before – has occurred twice this year due to warm winds and a climate-change driven heatwave in the northern hemisphere. One meteorologist described the loss of ice as “scary”. Others said it could force scientists to revise their theories about which part of the Arctic will withstand warming the longest. The sea off the north coast of Greenland is normally so frozen that it was referred to, until recently, as “the last ice area” because it was assumed that this would be the final northern holdout against the melting effects of a hotter planet..."
Photo credit: Reuters. "A giant iceberg that has drifted towards an Innaarsuit settlement in west Greenland." "This is About What We Breathe". Doctors Warn About Health Implications of Climate Change. Here's an excerpt from CBC: "...For the longest time, we were talking about the polar bears and asking people to change their behaviours on behalf of the polar bears," Howard said. "But really, we are seeing very clearly that this is about our children. This is about what we breathe." Some scientists have warned climate change is contributing to the intensity of forest fires with hotter, drier summers creating more extreme fire conditions. "The fires have been getting so much worse recently that the evidence based around smoke is really developing, but there are still some questions that we don't have answers to," Howard told Renee Filippone, guest host of CBC's The Early Edition..."
Photo credit: CBC. "A fire burns at the Pondosy Bay Wilderness Resort near Tweedsmuir, B.C." (Pondosy Bay Wilderness Resort). Most Economic Forecasts Have Blind Spot: Climate Change. A story at Click Orlando caught my eye; here's a clip: "...Climate change is having a real impact, not just on the environment but on the economy too. And a growing body of research by economists and climate scientists shows that extreme weather will weigh on economic growth even more so in the future. But almost no mainstream economic forecasting model takes that into account, in an omission that some economists say could affect the accuracy of economic predictions going forward. The most recent study to quantify the economic impact of the carbon emissions that spur climate change was featured last week in a brief by the Federal Reserve Bank of Richmond. By evaluating the performance of state economies in previous years, the report found that every one-degree increase in average summer temperatures decreases annual state-level output growth by between 0.15 and 0.25 percentage points..."
Exclusive: Some Arctic Ground No Longer Freezing - Even in Winter. 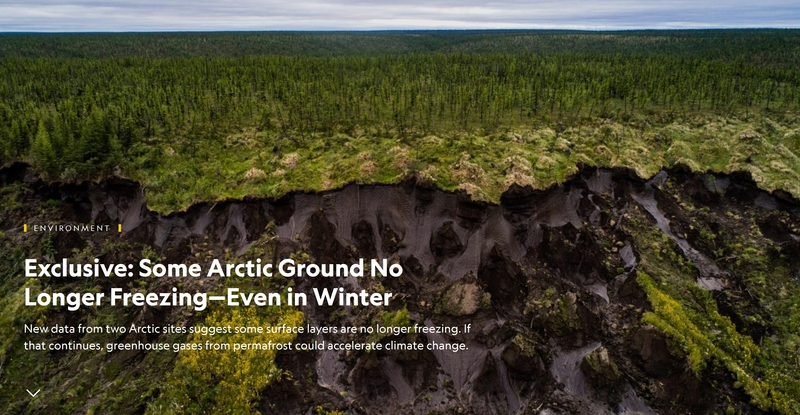 National Geographic has the story; here's a clip: "...Every winter across the Arctic, the top few inches or feet of soil and rich plant matter freezes up before thawing again in summer. Beneath this active layer of ground extending hundreds of feet deeper sits continuously frozen earth called permafrost, which, in places, has stayed frozen for millennia. But in a region where temperatures can dip to 40 degrees below zero Fahrenheit, the Zimovs say unusually high snowfall this year worked like a blanket, trapping excess heat in the ground. They found sections 30 inches deep—soils that typically freeze before Christmas—that had stayed damp and mushy all winter. For the first time in memory, ground that insulates deep Arctic permafrost simply did not freeze in winter..."
Photo credit: "Ground collapses at Duvanny Yar, a permafrost megaslump along the Kolyma River in northern Siberia. New research suggests that some land in Arctic Alaska and Russia may no longer freeze at all. This constantly moving landslide, driven by erosion and sped up by warming temperatures, is an important research site for scientists, who use it to track what happens as carbon-rich land that has been frozen for centuries begins to thaw." Photograph by Katie Orlinsky, National Geographic. Florida Can't Afford For Its Leaders to Keep Ignoring Climate Change. Here's an excerpt from Sun Sentinel: "...If the national politics on climate change is ever to shift from denial to action — in time to stop the disgorging of carbon dioxide beyond the point of no return — Florida, he says, is the key. Why? Because no other state is under greater immediate threat from the warming planet and rise in sea levels. And no other swing state has so many electoral votes. As Pomerance puts it: “The impacts are extreme and the politics are critical.” “This is the largest purple state in the country,” says Pomerance, currently a consultant for the nonprofit Rethink Energy Florida. If the state takes a new attitude on climate change, the “national impact can be very powerful.” This assessment comes from the original climate-change warrior. Almost nobody had heard of global warming when Pomerance first stumbled upon the concept in 1979..."
The Modern Automobile Must Die. So says an Op-Ed at The New Republic; here's an excerpt: "...In 2010, a NASA study declared that automobiles were officially the largest net contributor of climate change pollution in the world. 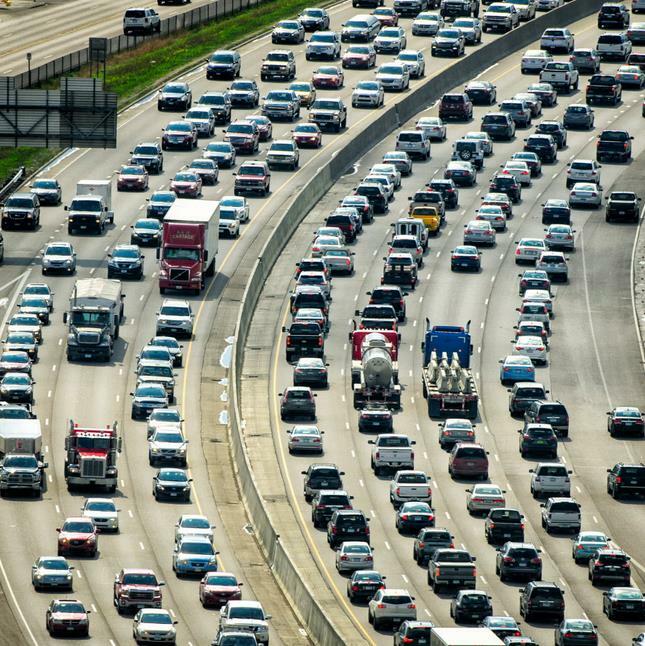 “Cars, buses, and trucks release pollutants and greenhouse gases that promote warming, while emitting few aerosols that counteract it,” the study read. “In contrast, the industrial and power sectors release many of the same gases—with a larger contribution to [warming]—but they also emit sulfates and other aerosols that cause cooling by reflecting light and altering clouds.” In other words, the power generation sector may have emitted the most greenhouse gases in total. But it also released so many sulfates and cooling aerosols that the net impact was less than the automobile industry, according to NASA..."
File photo: Glen Stubbe, Star Tribune. China, World's Biggest Polluter, Hits Carbon Goals - 12 Years Early. Daily Beast has the story: "In a year when climate change is moving from abstract theory to grimly tangible reality, a faint dot of hope may be on the horizon. China, the world’s largest source of planet-warming carbon emissions, may have hit the peak it promised in the Paris climate accord well before its 2030 timetable. That’s the conclusion reached by scientists who looked at the country’s estimated carbon output between 2007 and 2016, as the country’s rapid industrialization slowed and its consumption of coal declined. The research is published in the journal Nature Geoscience..."
Halfway to Boiling: the City at 50C. A ridiculous premise? It's already happening across much of the planet, according to The Guardian: "...Not long ago, 50C was considered an anomaly, but it is increasingly widespread. Earlier this year, the 1.1 million residents of Nawabshah, Pakistan, endured the hottest April ever recorded on Earth, as temperatures hit 50.2C. In neighbouring India two years earlier, the town of Phalodi sweltered in 51C – the country’s hottest ever day. Dev Niyogi, professor at Purdue University, Indiana, and chair of the Urban Environment department at the American Meteorological Society, witnessed how cities were affected by extreme heat on a research trip to New Delhi and Pune during that 2015 heatwave in India, which killed more than 2,000 people. “You could see the physical change. Road surfaces started to melt..."
Photo credit: "Melting asphalt cause road markings to distort in New Delhi." After a flawless weekend, Monday was a good day to focus on work or school or errands. No atmospheric distractions outside your window. Today looks beautiful with 60s and blue sky; a shot at low 70s tomorrow before we cool off late in the week - setting the stage for a few weekend showers.